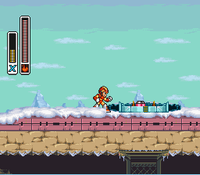 If you've previously defeated Chill Penguin (which tends to happen by following the recommended course), this stage will be frozen over, solidifying the dangerous lava pits. Now that you've defeated Chill Penguin (you have haven't you?!) Flame Mammoth's level will be significantly easier. 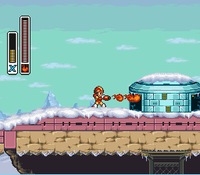 After defeating Chill Penguin Flame Mammoth's stage gets frozen over. All the pits of lava no longer exist and so you can cruise through this stage faster than any other. Step inside the capsule to receive the Buster Upgrade. 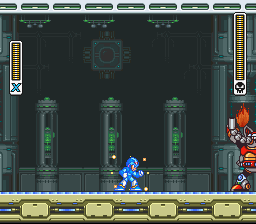 This allows X to deliver an even more powerful charged blast, as well as the ability to use an alternate fire for the Maverick weapons. Get to the area right before the pick axe throwers. Stand in the position as shown in the picture and then dash jump to where the blocks are. Destroy them with your new helmet upgrade in order to get to the capsule. 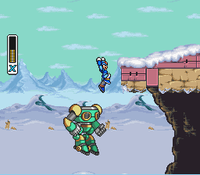 This is the most difficult jump in the game, since you have to leap from a very precise pixel and you will end up connecting with the block by Mega Man's head. Even if it doesn't look like it's going to touch, try jumping anyways; you may find that you can leap upwards anyways. Stand here and dash jump to the blocks in the corner. 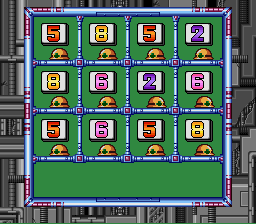 Destroy the blocks until you have a clear passage to the capsule. 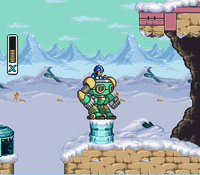 You'll be able to get both the Heart Tank of this level and the Sub Tank if you have beaten Chill Penguin. After you rush through several sets of conveyor belts (just run underneath!) you'll come to a wall with a large health power-up. Grab it, then fall down the pit. This next room contains many platforms with pick axe throwing robots. 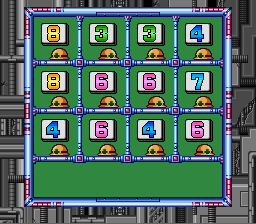 First, run to the bottom right corner and grab the Heart Tank. If you happen to come here with B. Cutter, frozen or not, you can use this weapon to grab the Heart Tank, even if it takes you several tries (B. Cutter does not cost energy as long as it does not hit an enemy). 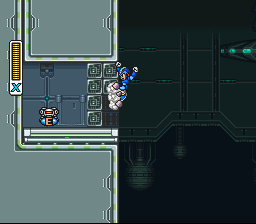 Second, climb up to the very top left, kill the two helmet bots and grab the extra life. Dash jump off the platform to the left, and climb the wall up to the Sub Tank. Wall jump on the blocks in front of it to destroy them, then climb through the gap and grab it. Be careful of the crushers! Now go all the way back to the other side of the room and keep scaling the wall until you reach the top. 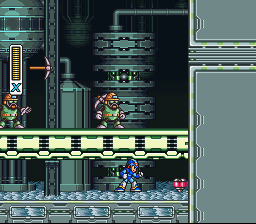 Head into the next area, which is a room filled with crushing machines and, you guessed it, more conveyor belts. If you stay too long underneath those crushers, they'll eventually come down and take a good portion of your health away. Time your movements and dodge the enemies that drop down as you make your way across the room. Jump up to fake the hoganmer into attacking in the wrong direction. Head out to the right. When you come to the set of tubes above and below you'll meet a few new hazards. Lava drips from above, spiked robots patrol the pipes and there are some guys (called Hoganmers) with spiked maces on chains that can only be struck while they are attacking. Keep going across the room, dodging the lava and spiked robots and destroying the Hoganmers until you reach the dungeon entrance. Step through and prepare to fight Flame Mammoth. 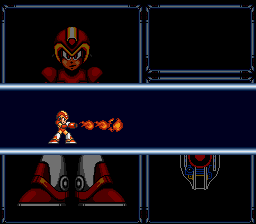 Abilities and attacks: can shoot flames from his arm, can spray a patch of oil from his trunk, can change the direction of the conveyor belt (you'll know it's coming when he cries out), and can leap towards you. 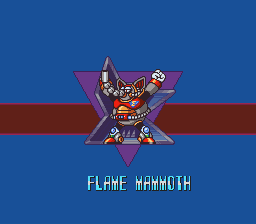 A heavy set fellow to say the least, Flame Mammoth slightly mimics the original Mega Man's boss, Guts Man, by having the ability to shake the ground after jumping. If you're on the ground when he lands, you'll be temporarily stunned. 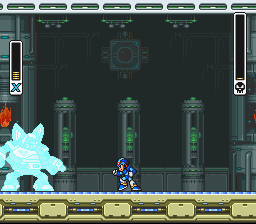 Like Chill Penguin, open up the fight with a fully-charged Buster shot, and then charge another one up again. Fire at him again, and at this point, he'll do one of his three moves. Regardless of what he does, keep shooting charged buster shots at him. The flames can easily be dodged, the oil doesn't hurt you unless it has been lit, and if he tries to jump over you, dash past him and jump (so you don't get knocked down when he lands). Keep repeating this strategy, and if he corners you, simply scale the wall and hide in the corner until he approaches (he can't jump high enough to hit you). 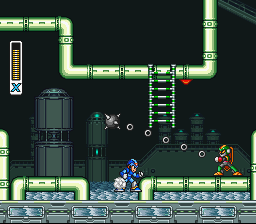 Once he's directly below you, use a wall dash to get past him (by sliding down the wall and using a dash you can increase the distance of your jump) and deliver a charged buster shot once you reach the ground. After this, repeat the above strategy, and if he corners you again, just use the wall dash. Alternatively, you can use the Shotgun Ice on him when you're cornered, and fire it at the wall so one of the shards hits him. However, he won't get hit if he's directly beneath you, so make sure he's a good distance away from the wall. If you have the Boomerang Cutter, three shots will slice off his trunk. Without it he can't spray oil (reducing his possible moves to three). Storm Eagle's weapon is Flame Mammoth's weakness, but if you're following this walkthrough you will have it when fighting him. Fire Wave! Your own personal flame thrower. This powerful short ranged weapon will come in handy when looking for Heart Tanks and other items. 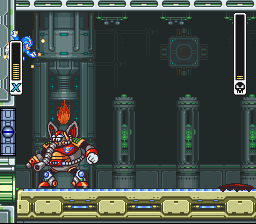 After beating Flame Mammoth, but before moving on to Sigma Stage 1, head back to Chill Penguin's stage and get the Heart Tank. When you get to the part with the Mech Armor, get in it and ride it to the part where there's a cave you have to go through. 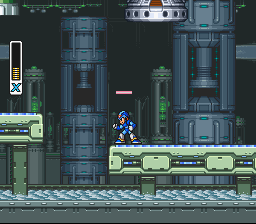 At the left entrance, you can jump off the ledge straight up, then jump out of the Mech and up onto the ledge. 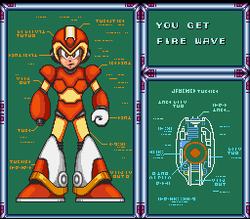 Use Fire Wave to destroy the first mosquito bot generator building up there and you'll see the Heart Tank lying inside. Alternatively, you can go through the cave and then jump up on top from the right side by dash jumping across the small gap. onto the top of the cave. This page was last edited on 12 December 2018, at 22:29. This page has been accessed 139,779 times.